Stay visible with former clients & get strong new leads with our email marketing campaigns. Some of the best new leads for businesses come from former clients. One of the least expensive, most effective ways for businesses to stay connected with former clients is via email marketing. The reality for many business owners is, however, that they simply don’t have time to take on managing an email marketing campaign while running their company. 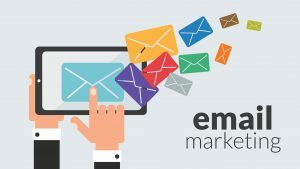 At Epic Visibility, we are ready to jump in and assist businesses in kicking off and managing email marketing campaigns. Equipped with solutions to meet any business’ needs and budget, we will develop and run successful email marketing campaigns for your business, helping you generate new leads while staying connected with former clients. Sending out email newsletters according to the selected frequency. Your email marketing plan will involve sending out newsletters monthly, quarterly or according to whatever frequency meets your budget and goals. Never sent out an email newsletter to former clients before? Don’t worry – we will help you get started. After talking to you about your business, we will identify where and how to get started and then immediately take action to get your email marketing campaign off of the ground. Don’t have a list of contacts to send newsletters to? No problem! We will work with you to figure out the best ways to start building a contact list so that you have a base of recipients to start sharing your newsletters with in no time.